The wild ponies of Chincoteague are legendary. Made famous in Marguerite Henry’s 1947 book, “Misty of Chincoteague,” these colorful, shaggy horses actually live on nearby Assateague Island. There are two herds, separated by a fence, with one living in Virginia and one in Maryland. These sturdy, resilient horses have learned to adapt over the years by eating marsh grasses and finding fresh water in ponds. Every summer, the ponies are rounded up and made to swim the channel between the islands so some of the foals can be auctioned off to raise money for the local fire department and to help control the size of the herd. But a recent outbreak has caused distress among the Virginia herd. Seven of the Chincoteague ponies have had to be put down due to an uncommon fungus-like infection called pythios. Also referred to as “swamp cancer,” the disease is caused by Pythiosis insidiosum, an organism that can be found in standing or stagnant water. Pythiosis typically survives when winter temperatures aren’t cold enough to kill the fungus. Although the fungus can infect dogs, cats and even people, it’s most common in horses, according to Today’s Veterinary Nurse. In the U.S., the disease is most often found along the Gulf Coast, but cases have been found in other areas across the country, including Illinois, Missouri, Oklahoma and Wisconsin. The fungus grows on dying or dead grass near the water. Horses often are infected when they stand in water with open cuts or sores. They can also drink, eat or inhale the dangerous spores. It cannot be spread from animal to animal or from animal to person. They have to come in direct contact with the fungus. Once the fungus is in a horse’s body, it compromises the animal’s immune system and starts triggering granular, seed-like lesions, often on the lower legs and abdomen. The disease sometimes can be treated with a therapeutic (not preventative) “vaccine,” immunotherapy and surgery. Treatment success rates are high if the disease is caught early, Georgia equine veterinarian Kenneth Marcella writes in DVM360. The key to dealing with this devastating illness is prevention, rather than treatment, say those who have worked on the front lines. A preventative vaccine is being developed, but it hasn’t been approved by the U.S. Department of Agriculture yet. In the meantime, the disease is on the radar of other wild pony protectors, as they hope it doesn’t impact their herds. The outbreak has people also concerned about the ponies that roam North Carolina’s Outer Banks. “Are the horses here in Corolla at risk? 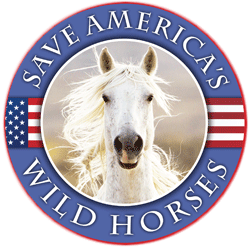 The short answer is yes, they are,” the Corolla Wild Horse Fund wrote in a Facebook post. Volunteers and people who care for the horses are asking people to help clean up the area to reduce the risk of injury so the fungus would be less likely to cause an infection.